Is it possible to recover lost data to Mac from iPhone after iOS 9 upgrade? Data lost after a successful iOS 9 update is possible to be recovered. You can recover the lost data directly from iPhone to Mac computer after the iOS 9 update. There are various reasons for data losing related to iOS 9 update, but we need only one solution to recover the lost data after the iOS 9 update. If you have upgraded your iPhone to iOS 9 successfully, there are possibilities to recover the lost data directly from your iPhone, even if you don’t have any iTunes or iCloud backup. To make sure you don’t need to worry about losing data again, you are suggested to recover the lost data to your Mac computer for backup or record keeping. If you have synced your iPhone and created backup file, you can refer to our guide about how to retrieve lost data from iTunes backup file. 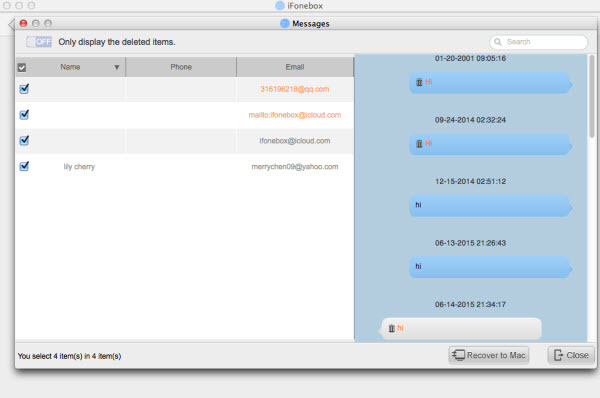 iFonebox, as specialized iPhone data recovery tool, makes it possible to recover lost data directly from iPhone, and it is capable of recovering Contacts, Notes, Messages, WhatsApp Messages, Call History, Safari Bookmarks, Reminders, Voice Memos, and Photos etc. Besides, you can choose to transfer the recovered data to your Mac computer if you are using the Mac version of iFonebox. You can download a free trial version to make sure whether iFonebox can scan and locate your lost data and then decide whether to pay for the full version. To recover the lost data directly from iPhone after iOS 9 update to Mac computer, you need to make sure you have downloaded the iFonebox for Mac and your iPhone is accessible. Then you will find out that recovering lost iPhone data to Mac after iOS 9 update is as easy as a few clicks. Below are the specific steps. Install the full version of iFonebox for Mac and start it up. Connect your iPhone to your Mac computer and wait until it is recognized by iFonebox for Mac. Click the bottom button of “Start” when your iPhone is detected. In this way, you have chosen the recovery mode of “Recover from iDevice”. Note: If you iPhone does not show up and cannot be recognized by iFonebox, please check whether you have plugged in your iPhone to your Mac computer properly, or whether you have entered the pass code to unblock your iPhone or whether you have clicked to confirm “Trust this computer”. The following interface will show you all the supported data categories and you can choose one to recover just by clicking on the related icon. Here we choose messsages to recover for demonstration. If you want to recover all the data, please check “Recover All”. It will take some time for iFonebox for Mac to san and analyze your data, please wait with patience. After your lost data have been exported, please take a preview and select whatever you want to recover to your Mac computer before hitting the button of “Recover to Mac”.